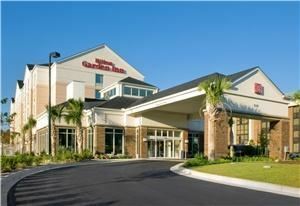 Hilton Garden Inn Mobile West I-65/Airport Blvd. The Hilton Garden Inn Mobile West is centrally located within Mobile's shopping, entertaining, and distinctive dinning establishments. We are centrally located between the Mobile downtown business hub, and Mobile’s Airport. You will be greeted by a stylish lobby adorned with comfortable furnishings, gorgeous tile floors and flowers accented by modern decor. Hilton’s years in the business providing the highest level of personalized service beckons with the promise of 101 spacious guestrooms that feature every guest comfort, including The Garden Sleep System Adjustable beds with comfortable duvets, large work desk with convenient desk-level outlets and adjustable lighting with the ergonomic Mirra chair by Herman Miller. Each guest room is equipped with a microwave, refrigerator and coffee maker for your guest’s convenience. Hotel dining showcases traditional fare at the Great American Grill Restaurant for breakfast, dinner and evening room service seven days a week. Our Lobby Lounge offers a relaxing setting to enjoy an evening cocktail with family and friends. Recreational amenities include an outdoor pool and Jacuzzi, as well as, a separate state of the art fitness center. Golf courses and Mobile’s tennis center and park are available nearby. Your guests will enjoy local attractions such as the USS Alabama, Bellingrath Gardens, Downtown’s Immaculate Conception Cathedral and Southern Antebellum homes in Mobile’s Historic District. Casual or elegant, the hotel’s 1200 square feet of function space will be ideal for events of every type, Including rehearsal dinners, bridal luncheons and showers, intimate receptions or a farewell Sunday Brunch. The USS Alabama Ballroom offers ideal comfort, and can accommodate groups up to 100 people, and subdivides into two separate rooms accommodating groups up to 50 people. Our professional catering staff is precise in every dining presentation. Our staff will customize menus for your budgeted special event and handle every request, ensuring successful results. We cordially invite you to come and visit the Hilton Garden Inn Mobile West, and experience for yourself the warm and attentive Hospitality expressed by our staff. Please call me to set-up your site visit. We look forward to hosting your upcoming Wedding events. Our beautiful surroundings only enhance your special event, whether it is a wedding, family reunion, reception, fundraiser or birthday party! At Craft Farms your event can be anything from elegant to casual, from an outdoor barbecue or an elegant five-course seated meal.